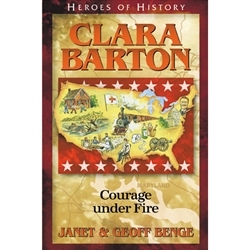 Known during the Civil War as the "Angel of the Battlefield," remarkable Clara Barton risked everything to save countless lives on the frontlines of battle. Once a painfully timid child, Clara was as bold as a lion when it came to helping others, whether wayward schoolboys, natural-disaster victims, or dying soldiers. Clara fought for U.S. approval of the Geneva treaty for the care of war wounded, organized the American Red Cross, and tirelessly dedicated her life to its service. Her courage and compassion impacted thousands of people around the globe - black and white, Christian and Muslim, Spanish and American, Confederate and Union. An incredible story of service and sacrifice (1821-1912).